Tauric, the fourth of White Star’s seven cattle carriers, was built by Harland & Wolff, Belfast. Launched in 1891, she entered service on 16 May of that year, making her maiden voyage from Liverpool to New York. 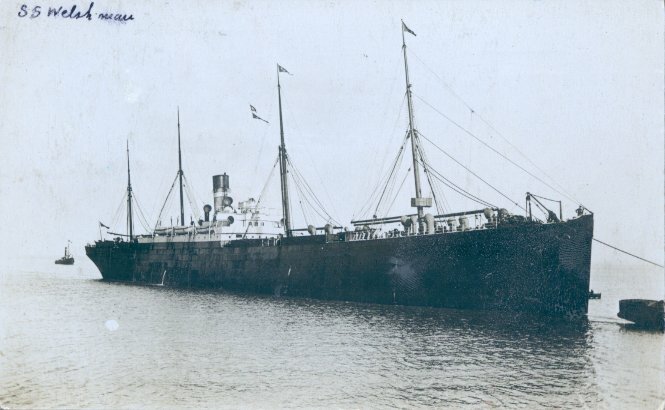 She remained in White Star’s service until she was transferred to the Dominion Line in 1903. (The Dominion and White Star Lines were both part of the International Mercantile Marine Co. combine.) She made her first Dominion sailing, from Liverpool to Portland, Maine, on 12 March 1903, still under the name Tauric, but in 1904 she was renamed Welshman. Welshman was transferred to Leyland Line ownership in 1921, when IMM began reorganizing its holdings and gradually eliminating the Dominion Line. Welshman was broken up at Bo’ness in 1929. Sources: Haws’ Merchant Fleets; Moss and Hume’s Shipbuilders to the World; Anderson’s White Star.